My schedule is usually very hectic. Working a 9 to 5 with endless freelance hours and trying to maintain a social life on top of that can become overwhelming. That’s why I take my nighttime routine seriously when I am trying to unwind from a busy day or week. I think that preparing for a good night’s sleep is important for your health, well-being, and mind. Below are some tips and tricks that I’ve found have worked the best for my routine, I am happy to share and hope the same serenity happens for you. Before I head to bed, something that I enjoy doing is tidying up my room. I personally feel that when any space I’m in is in order then I feel slightly more in order. I feel that when my room is a mess that this contributes more to the weight of stress on my shoulders from the day. Having a tidy room or a made bed before you go to sleep can help you relax and have you feeling more organized. I came across this shower routine not that long ago via Instagram; it involves putting a few drops of lavender into your hot shower prior to getting in, having a salt lamp on in the bathroom with the overhead lights off, and having calm and soothing music playing. I gave this a go and I just can’t go back. A shower alone is amazing to de-stress after a long day, but this routine does wonders for the soul. HIGHLY recommend. I have always been a tea drinker, so this has always been a part of my nightly routine. 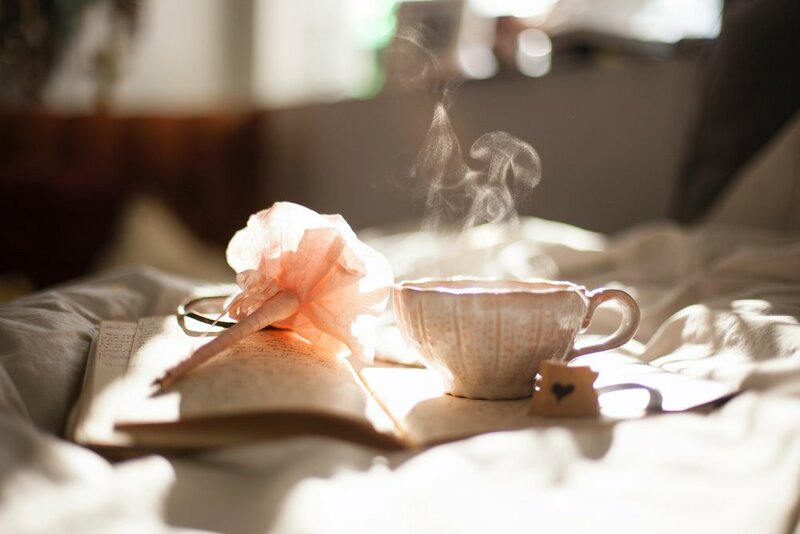 What better way to relax than to sip on a cup of chamomile tea to warm you up before a good night's sleep? Another tea that is great for before bed would be Mother’s Little Helper from David’s Tea, which contains Valerian root, which is known to relax nervous tension and induce feelings of sleepiness. It is also said to help digestion and to ease the mind. While sipping on my tea, I like to light a calming candle; my personal favourite is the Stress Relief candle from Bath & Body Works or any scent that has lavender. I also love using my essential oil diffuser. With essential oils there is a range of different relaxing scents, a quick Google can provide suggestions for what is the best fit for you. Silence isn’t for everyone when it comes to sleep, at least not always for me. I personally don’t enjoy falling asleep to TV, but sometimes I do enjoy some background noise, which is why if I’m looking for help to fall asleep I like to turn on a relaxing nature sound compilation or a soothing meditation playlist. This really helps me drown out my worries from the day and has me fall asleep with a clear mind. Meet Mariah – A Toronto 22 year old Toronto native who likes to characterize herself as knowledgeable, charismatic, driven and most definitely witty. She describes her career as endless because she believes that there is an opportunity everywhere and anywhere you end up, it’s all about perspective. Mariah studied journalism at Durham College in Oshawa, Ontario. A program she came out of with confidence, ambition, and overall excitement to build a network for herself. Once graduated she promised to dive wholeheartedly into everything that she does and with that she interned at Lifestyles Magazine—the world’s only donor-focused, solely dedicated philanthropic media platform— where she was later hired as the coordinator, climbed the ladder to production coordinator, and now as the director of communications.Since her work at Lifestyles began over two years ago, Mariah has worked an abundance of freelance in her spare time, but because it is “on the side” doesn’t mean that it’s ever neglected, like she said, with anything she does it is done wholeheartedly. Mariah is currently a contributor to Healthy is Hot—a digital space online and via Instagram founded by Chloe Wilde, host of E! in Canada and Canada’s #1 Entertainment Show, etalk, where body-positivity, self-love, and female empowerment is promoted and where honest discussions on all aspects of health: mental, spiritual, physical, emotional, sexual and everything in between is encouraged. This opportunity has allowed Mariah to network and submit her reviews, tips, and tricks from her own world of wellness, all of which lead her to Seek Minimal—a new journey she is ecstatic to take on. Aside from her career, most of Mariah’s time is consumed—she means this in the best way possible—by her family and friends, playing soccer on weekends, staying active with pilates and yoga throughout the week and her ultimate favourite, self care.